Jabotinsky giving his "I believe"
ZE'EV (VLADMIR) JABOTINSKY (1881-1940) founded the Revisionist Zionist movement and was one of the most important Zionist leaders after Herzl. He was one of the primary Zionist figures pushing the Zionist agenda forward in th he diplomatic and public spheres. He popularized Jewish self-defense, illegal immigration, fostered the movement which forced the British out of Palestine. He founded the Zion Mule Corps., the Jewish Legion and the Haganah. What distinguished him most from other Zionist leaders was his insistence on declaring loud and clear the uncompromising goal of Jewish statehood and the need to save the Jews of Europe. Other Zionist leaders like Weizmann and Ben-Gurion refused to either protest the limits on Jewish immigration and insist that a Jewish majority in Palestine was a goal of Zionism until it was too late. 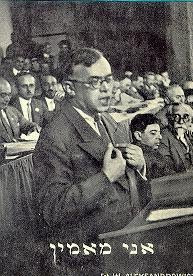 Jabotinsky was bitterly hated by his opponents in the mainstream, especially the socialist groups, and dearly loved by his supporters, who numbered in the hundreds of thousands. When he split from the Zionist Organization to form the New Zionist Organization in 1935, the turnout at the Revisionist Congressional elections exceeded that of the regular Zionist Congressional elections. Jacob de Haas, the prominent American Zionist and biographer of Herzl, called Jabotinsky the second Theodore Herzl. Others have referred to him as the Jewish Churchill or Garibaldi. Jabotinsky’s movement and teachings, which can be characterized as national-liberalism, form the foundation of the Likud party.